This post is especially geared for my fellow North and South Carolina based readers, but anyone is welcome to take note and enter!! :-) I was recently contacted by Jacki, a PR rep for Oasis, which is a British fashion brand that has stores across Europe and Asia and online shopping available globally (including in the US!). 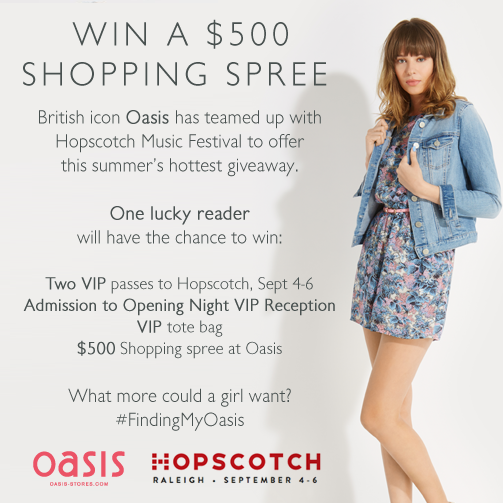 She wanted me to share with y'all that Oasis is currently hosting a great contest where you could win a $500 gift card to use on a shopping spree at Oasis, and two tickets to the Hopscotch music festival that is happening from September 4-6th in Raleigh, NC! You can learn more about the Hopscotch music festival by clicking here- I briefly looked at their website earlier tonight and was so impressed to see how big this festival has gotten in the four short years that it's been around! It is super easy to enter this contest, all that you have to do is enter your name, e-mail, and describe your favorite festival fashion accessory! How simple is that?! Enter the contest here!! Stay tuned in the next few weeks for a fashion collaboration between Southern Belle in Training and Oasis- I can't wait to review and style something from this fun British brand! !